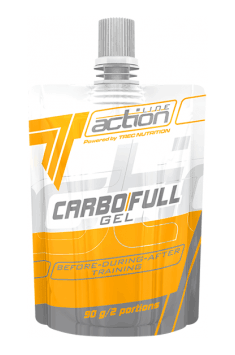 45-90 g of gel (0,5-1 sachet) used in small portions before, during and after training. It works best when used during workouts, especially endurance trainings and after ending them. Dosing should be adjusted to the intensity and length of training sessions – the longer the training, the more sachets we should prepare. Usually one or two sachets should be enough. Dietetic aroma with the consistency of a thick liquid. It gives the dishes delicious taste. A combination of electrolytes, creatine, D-Ribose, niacin, and taurine to support workout efficiency. Foam à la whipped cream, zero calorie. Delicious addition to desserts, coffee or hot chocolate. Supplement containing creatine monohydrate and taurine. It accelerates muscle growth and increases strength. Amino acid complex for a whole day. It reduces catabolism and supports anabolic processes. The energy value is determined by the chemical composition of the food product, by means of the so-called. physiological equivalents energy., determining the value of metabolic energy contained in 1 g of the component. Most commonly used is the equivalent of Atwater: protein 4 kcal/g for carbohydrates 4kcal/g, and for fat 9kcal/g. Proteins (proteins, polypeptides) is a polymer, of which the basic units (monomers) are amino acids. Protein is composed of carbon, oxygen, nitrogen, hydrogen and sulfur, and is an elementary nutrient necessary for the proper functioning of the body, an ingredient and a component of tissues, part of the hormones and enzymes and other bioactive substances. Protein determines the proper metabolism and energy processes, as well as all other life processes. The sources of natural proteins are foods of animal origin (including meat, fish, eggs, dairy products) and plant origin (legumes, soy). Deficiency of protein leads to protein malnutrition and a significant weakening of the body. It can lead to anaemia, reduced immunity, muscle relaxation, disorders of the digestive system. Also, overdose protein is undesirable because it can lead to acidification of the body, and interfere with the digestive system and an increase in the concentration of homocysteine ​​in the blood. It is a component of many supplements and nutrients necessary for the proper functioning of the body, both showing a low physical activity, or training the strength and endurance competitions. Fat is an essential nutrient plant and animal organisms. Because of the nutritional value and composition of fats are divided into: saturated (mono-saturated and multi-saturated fatty acids) and unsaturated fatty acids (including essential fatty acids - EFA). The group of lipids include lipids (triacylglycerols, waxes), complex fats (glycolipids, phospholipids), sterols and isoprenoids. Saturated fatty acids is a group of fatty acids having different carbon chain lengths, in which except for the carboxyl group, each of the carbon atoms is bound by a single bond. May adversely affect the lipid profile, so they can be used in limited quantities. Fats are a concentrated source of energy, with different flavours, facilitating the consumption and swallowing of food. They have building functions (part of cell membranes and co-create the white matter of the brain). EFAs are precursors of tissue hormones and biologically active compounds. The unsaturated fatty acids include fatty acids from the group Omega-3, Omega-6 and Omega-9 (the last digit indicates, on which, counting of the end of the chain, there is a double bond in the appropriate carbon chain. The essential fatty acids include: acids, medium-Omega-3 [n-3 ] included in EFAs [essential fatty acids], and long chain (eicosapentaenoic acid [EPA] and docosahexaenoic acid [DHA]) Omega-6 and Omega-9. the number indicates that the last double bond in the carbon chain is on the third from the end carbon atom. The acids from the omega 3 group are essential components of cell membranes, they are precursors of eicosanoids and biological activators. They must be combined with ingestion in suitable proportions of Omega-6 acids. Dosage: Depending on demand and applied diet. It is generally accepted that fats should constitute 20-30% of the energy (calorie) of meals daily. Carbohydrates are an essential nutrient. They are divided into: simple sugars (monosaccharides), disaccharides and polysaccharides. In terms of the human bioavailability of carbohydrates is divided into: digestabe, those which are digested in the gastrointestinal tract by transferring energy to the tissues or cells (such as starch, fructose) and indigestable, resistant to digestive enzymes (e.g. cellulose) . Affects blood glucose levels (glycemic index) and the metabolism of insulin (insulin index). The greatest demand for carbohydrates occurs before physical activity or in the middle of it, because they increase the exercise capacity, consumed after exercise provide regeneration. In the sports diet the absorption rate it is important of carbohydrates and reactions of the organism. Available in mono-preparation supplements and part of the energetic supplements, creatine stacks, nitrogen boosters. Dosage: according to the statistics of the Institute of Food and Nutrition, carbohydrates should comprise about 50% of daily energy intake. In some diets, used residual carbohydrate consumption, not exceeding 30g / 24h. Dietary fibre is a mixture of undigested substances and not absorbed by the human body. Due to the properties divided into: insoluble fibre (e.g. cellulose [polysaccharide] found in fruits and vegetables), partially soluble fibre (including hemicellulose occurring with cereal grains and soluble fibre (including pectin, gums, mucilages [polysaccharides]). Dietary fibre affects the digestive system and gastrointestinal system regulating its operation. By filling the stomach (satiety) reduces appetite, lowers triglycerides and cholesterol and consequently can support the weight loss process and maintain a slim body. It also affects blood glucose levels and cleansing the body of toxins. Available in powder formulations (capsules, and powders), mainly containing the soluble fraction (pectin, gums and mucilages) diet and meal replacements. Dosage: 10-20 grams per day, before or during meals with some water. The active ingredients are complex components responsible for the proper functioning of the human body, whether natural (animal or vegetable) or synthetic (same effect) which, after consuming (and digesting) make a corresponding physiological effect of the body in line with their respective characteristics. For example, these include caffeine and green tea extract used as an ingredient in fat burners, ingredients that cause increases in energy and individual body systems. In addition to the active ingredients, should be mentioned additional ingredients which prolong the product life and give them a determined physical or chemical properties. Available at www.muscle-zone.pl in the form of multi-component supplements and mono-preparation supplements. Maltodextrin - complex carbohydrates derived from starch by enzymatic depolymerization, having a long and high bioavailability (bioavailability comparable to glucose). They are divided into low-sugered, medium-sugered and high-sugered, wherein each of the has a high glycemic index (GI) - more than 80 to approx. 110. These are an easily digestible source of energy, supporting the insulin metabolism, supplementing muscle glycogen and that improving creatine and amino acid transport into cells muscle, influencing the increase in exercise capacity. In the sports supplementation preparations containing maltodextrin are used pre- and post-workout and as a complement to the energy value of food. Dosage: the lack of standards unit consumption. The supplements conventionally used 20-70g / 1 doze, about three times a day of training. Not recommended to take preparation before going to sleep, and for use by people with a tendency to weight gaining. Isomaltulose (Palatinose ™) - disaccharide built from simple sugars: glucose and fructose bound by a glycosidic bond 1,6-, with a low glycemic index (GI = 32), sustained energy release without causing excessive insulin growth and, consequently, without the increase in adipose tissue. It is fermented in the mouth causing dental caries. Natural sources of Isomaltulose are sugar cane and honey. In the sports supplementation (and dietetics) it is a component of carbohydrate and protein-carbohydrate supplements and pre- and post- workout stacks. Dosage: As a dietary supplement and personal energy needs. Glycine is belongs to 22 essential amino acids (synthesized within the body) constructing proteins, and non-protein component of enzymes i.e. heme. It is a inhibiting neurotransmitter allowing for improvement in sleep comfort even at a dose of 3 g at bedtime. Glycine (as arginine) is a precursor of creatine. It is essential for the synthesis of a strong antioxidant - removing free radicals out of the body - glutathione. It is cholagogic and cholepoiteic. By interfering with the synthesis of growth hormone, accelerates the biological recovery of an organism. Naturally present in foods of plant and animal origin. In the sports supplementation is a component creatine stacks, amino acid supplements, protein supplements based on natural ingredients and carbohydrate and protein. Taurine – non-protein amino acid containing sulphur, which is synthesized in the body from methionine and cysteine, present in sufficient amount in human or animal body (in the brain, heart and skeletal), although in some cases must be supplemented. Significantly affects the calcium content in the cells and stabilizes the water and electrolyte balance and maintains acid-base balance. Takes part in the synthesis of bile acids. In the body acts as a neurotransmitter and neuromodulator. It is an insulin-mimetic improving insulin metabolism, responsible for transport of nutrients (such as amino acids, glucose, creatine) to the cells and muscle tissue. These properties determine that it is a valued mono-preparation supplement and valuable addition to creatine and amino acid supplements, recommended for psycho-pchysically active people and athletes and other competitive sportsmen in pre- and post-workout periods. Dosage: 3 grams per day. Calcium (element chem. symbol Ca, atomic no. 20, the group of alkaline earth metals) is the basic building substance of bones and teeth, in which stored is 99% of the element, in the form of hydroxylapatite. When building bones and teeth, phosphorus is very important in the right proportion. It is a base-forming element and activator of many enzymes (ATPase) necessary to release the energy of ATP. It has a significant effect on blood clotting and regulates blood pressure and neuromuscular conductivity. Thanks to the reduced permeability of cell membranes, it soothes the symptoms of food allergies. Calcium is actively involved in the metabolism of iron interacts with vitamins A, C and D and phosphorus, magnesium. Natural source of calcium are animal products (dairy products, sardines, salmon, sprats eaten with bones) and plant products (nuts, soybeans, sunflower seeds). Absorption takes place in the small intestine (less in the colon), it has an effect on the level of lactose, insoluble fibre, organic acids, alkalinity (low pH). The best absorption have organic compounds (lactates, amino acid chelates etc.). Obstructing the absorption of calcium is caused by: phytic acid and oxalic acid as well as excess fat. Scientific studies have confirmed that the combination of calcium, magnesium, boron and vitamin D in dose 3 mg / 24h effectively prevent osteoporosis. Supplements on the market are both mono-preparation supplements (enriched with vitamin D3) and multi-component supplements, available at www.muscle-zone.pl. Calcium deficiency disorders manifested in the construction of the bones (osteoporosis) and iron metabolism. The symptoms are: rickets, cramps and muscle tremor, osteoporosis. Excess resulting from an overdose of calcium supplements containing vitamin D3 for children and adults overdose of calcium (hypercalcemia). Symptoms of hypercalcemia are: lack of appetite, vomiting and constipation. Magnesium (element from the group of alkaline earth metals, atomic no. 12, a chemical symbol - Mg), one of the most important health microelements, participates in the synthesis process of the disintegration of high energy compounds and processes of transformation of hydrocarbons and fats. It affects the dilation of blood vessels and lower blood pressure, prevents hypercoagulable state. Shortages affect cardiac arrhythmias, malignant muscle cramps, insomnia and anxiety. It is a component of many dietary supplements and found in foods such as whole grain bread, legumes, buckwheat, rice, fish, meat, as well as chocolate, cocoa and nuts. Potassium and sodium regulate the body's water resources, ensuring normal heart rhythm. Maintaining the proper level of potassium provides the proper oxidation of the brain, lowers blood pressure, increases the permeability of cell membranes (as an antagonist of calcium). It is a base-forming element. It is widely used in sports diet before and after training in the form of supplements, nutrients, vitamin-mineral preparations and minerals, concentrates and ready, isotonic and hypertonic beverages. Natural sources of acquisition of potassium are: vegetable products (bananas, citrus fruits, melons, mint leaves, green vegetables, potatoes) and animal products (sea fish, meat). Potassium is present in the form of organic compounds: citric acids, and fumarates gluconates and inorganic (chlorides, sulfates, oxides and carbonates). Potassium deficiency (hypokalemia): excessive tiredness, headaches and irritability, problems with sleeping, muscle cramps, constipation. Potassium levels may drop sharply in the event of a reduction in blood sugar levels, prolonged starvation, severe diarrhea. They can occur when too much of strong coffee is consumed, with alcohol abuse and when eating too much sweets. The excess of potassium (hyperkalemia) is often the cause of depression, hypotension, tingling in the extremities. Chlorine (chemical element from the group of halogens) - in the natural form of gas it is poisonous and water-soluble (until recently used as a disinfectant in the water supply system, now replaced by fluorination). It is chemically active element. It is used in the form of sodium chloride (NaCl) and potassium (KCl). It participates in the process of digestion and maintains acid-base balance in the body, removes toxic products of metabolism in the liver (antitoxin). Natural source of chlorine for the body is salt and bladderwrack. Chlorine deficiency can occur due to excessive sweating, vomiting, causing digestive tract problems. It also causes loss of hair and teeth. Excess chlorine, for example. Drink excessive amounts of chlorinated water, destroys bacterial flora and vitamin E.
Dosage: Daily dose should not exceed 15 grams.